Wondering how to keep a patio umbrella from falling over? Chilling under a good patio umbrella is one of the best ways to enjoy a bright sunny day. Even if you are doing some work on your laptop or if you just want to adore the beauty of nature along the seaside, patio umbrellas are there for you. They fight against the scorching sunbeams—be it the garden or any poolside. They also offer an aesthetic appeal to the surroundings. However, the major problem that you might come across is the fact they always fall over once strong winds hit. For that, we’ve got you covered. To help you solve this issue, we have jotted down a few preventive measures that you can do. 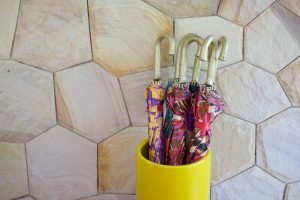 These techniques will surely help you to overcome this very common problem that all of patio umbrella owners experience. If you aren’t using them, it is better to keep your patio umbrella closed. 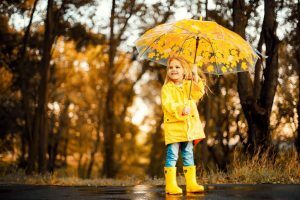 In this way, you can decrease the risks of damages that a falling umbrella can cause. Tie the cord tightly around the fabric so it won’t open when the wind blows. Some patio umbrellas come with Velcro strap while others have a separate cover. If your umbrella has a cover, keep it closed and covered. A heavy and sturdy base provides maximum support to your patio umbrella. Those that are made up of granite or cement are the best ones to use. Some umbrellas come with a heavy base, while for others, you may need to buy them separately. It is also a good idea to buy a sandbag or extra weight if you live in a windy area. The weight of the base depends on the size of your umbrella. 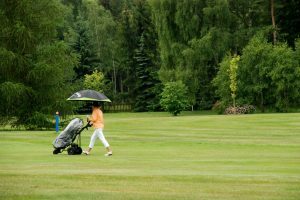 For the umbrellas that are somewhere between 1.82 to 2.3 meters, then use a base that weighs no less than 16 kg. On the other hand, for umbrellas that measure 2.3 to 2.8 meters, a base that weighs 18 to 25 kg is ideal. If the size is 2.8 to 3.35 meters, use a base that weighs 30 to 35 kg. Lastly, if your umbrella is positioned in an area that receives a lot of wind, then it’s better to use a base of 45 to 100 kg. 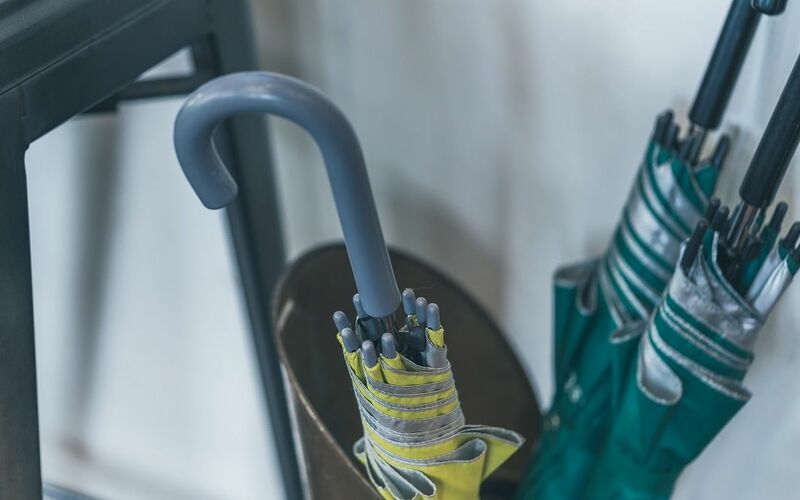 Although the wooden ribs can give a classy look to your umbrella, they easily break apart in case of a strong wind or storm. If you are fond of woody touch, use the eucalyptus wood as the skeleton of your umbrella. The eucalyptus wood is known for its durability. On the other hand, you can prefer aluminum as the basic material of the umbrella’s frame instead of steel or plastic. It is reliable and has a longer shelf life. Wind is the biggest enemy of your patio umbrella. If you are living in an area that receives a lot of wind and experiences a lot of storms, try to be proactive against them by keeping track of the wind and storm cycles. 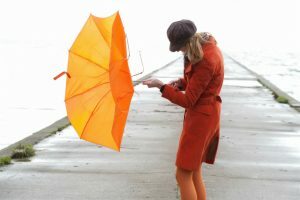 In this way, you can close the umbrella once the weather starts to get windy. You can carry a large corkscrew and screw it in into the ground. Thump this stand over the top. The resulting tripod-like structure can stand long against the wind. The patio umbrellas have an air canopy at the top. The purpose of the canopy is to vent out the air. It ensures the smooth flow of air and prevents the chances of inversion. If you are going to buy a new umbrella, buy the one that has air venting canopy. The tables that you are using with the patio umbrella can also provide support to it. It depends on the quality of the material of the table. It may not be the long-lasting solution, but it can be effective up to some extent. Although it is one the basic step, using an outdoor umbrella stand is one the most reliable solution of your problem. If you are not using a table along with the umbrella, do not forget to install the outdoor umbrella stand with it. 1. Supplemental Weight Bags. 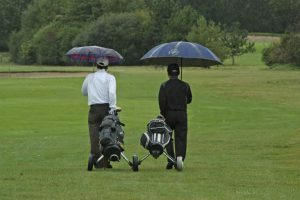 If the diameter of the umbrella is more than nine inches, you should try using a supplemental weight bag. It adds additional weight to the umbrella. Hence, the bag gives strength to your umbrella. These bags are placed on the base of the umbrella and can add up to a hundred pounds of weight. 2. Use a Cantilever Umbrella Base. These bases can add up to 125 lbs of weight to your umbrella. The cantilever bases are expensive but highly functional. The bases come in various designs, so you can choose the most suitable one for your umbrella. 3. Use DIY Sand Bags. If you do not want to go for the supplemental weight bags or any other base, then you might like to use a DIY base. The easy-to-make and easy-to-install sandbags can provide support to the umbrella. You can also design your own sandbags that can complement the umbrella. 4. Use Gravels. One of the easiest ways to add weight to your base is to fill a bucket with colorful gravels. Then, insert the pole of the umbrella in the gravel-filled bucket. This can be one of the eye-catching umbrella bases that you will ever see. You just need to use your creativity. 5. Use the Cinder Block Method. 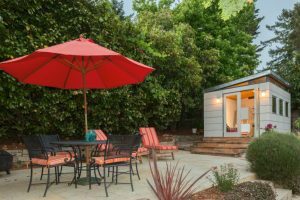 If you want, you can even paint a cinder block and slide it under the umbrella base. After that, insert the pole of the umbrella in the hole of the cinder block. The umbrella can rest on this cinder block base. 6. Use a Christmas Tree Base. Insert a few sticks in the base of the umbrella. The key here is to insert them in a radiating way, like a Christmas tree. This will prevent the umbrella from blowing away with the wind. 7. Use Lead Bags. Using tube-shaped lead bags is another effective solution to the problem. The base of lead bags is small and heavy. They provide weight from one to 10 pounds. 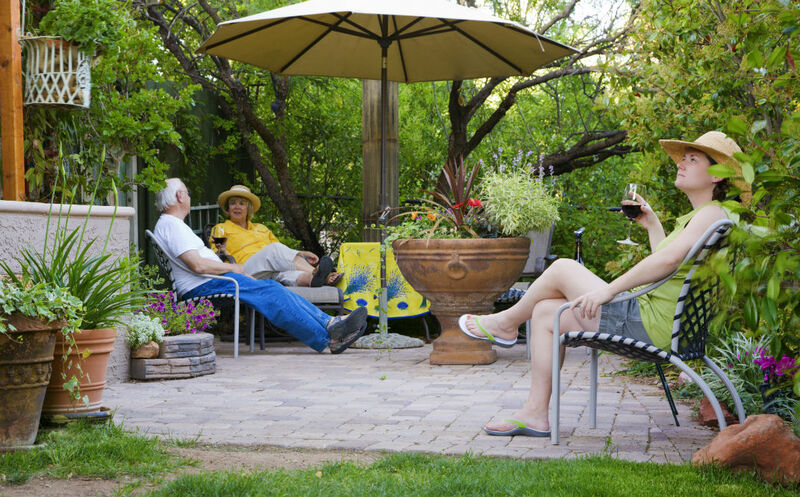 If you like to enjoy the windy, breezy weather, then using patio umbrellas are best to go with it. You can relish the perks of summer while chilling under these umbrellas. 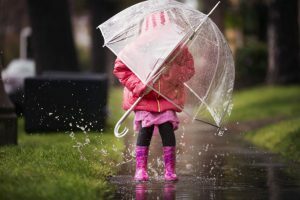 However, the key to keeping the umbrella safe is to use the sturdiest material for the frame and base. 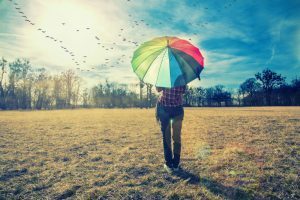 The stronger the base is, the longer your umbrella can sustain winds, which also means the longer you can stay outdoors comfortably. 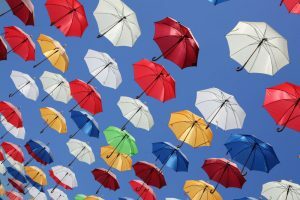 We really hope that these measures can solve your query about how to keep patio umbrella from falling over. Happy windy day!